Courtesy of Statoil Hywind floating turbine demo off the coast of Karmøy, Norway. Courtesy of Statoil Illustration of a spar-buoy floating turbine, one of three potential designs being considered by the National Renewable Energy Laboratory. 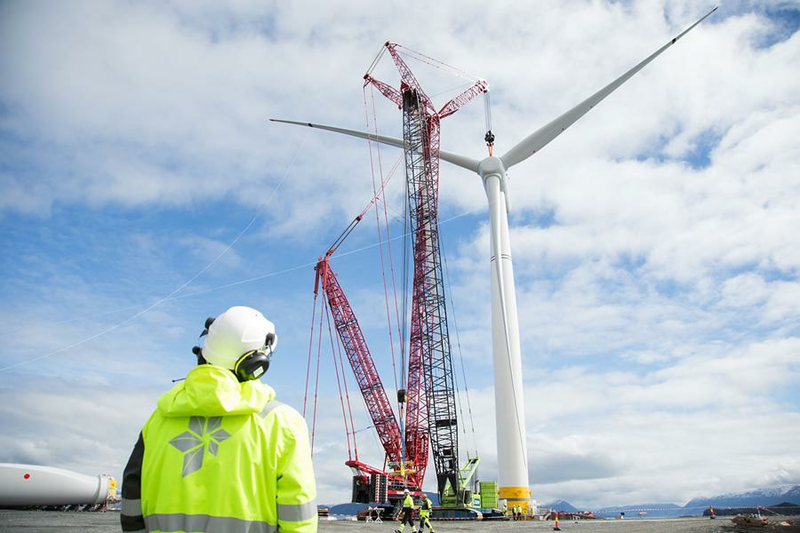 Courtesy of Statoil Hywind Scotland first rotor being lifted into place. Courtesy of Statoil The unmounted Hywind Scotland rotor. As legalized recreational cannabis takes hold in California, some Humboldt County officials think the local economy's future isn't tied to farms in the hills. It might be in the wind. "Frankly, we've got pretty much the best offshore wind resource in the entire country," he says, adding that the North Coast has the kind of consistent, strong winds that make wind energy companies salivate. "The wind has always been there and that's been known." What's historically ruled the North Coast out of wind energy discussions, Marshall says, is that the waters off the local coast "get too deep, too quick," meaning the wind turbines used in shallow waters off the East Coast and elsewhere won't work off the Humboldt County coastline. But a new floating platform technology is proving to be a game changer. 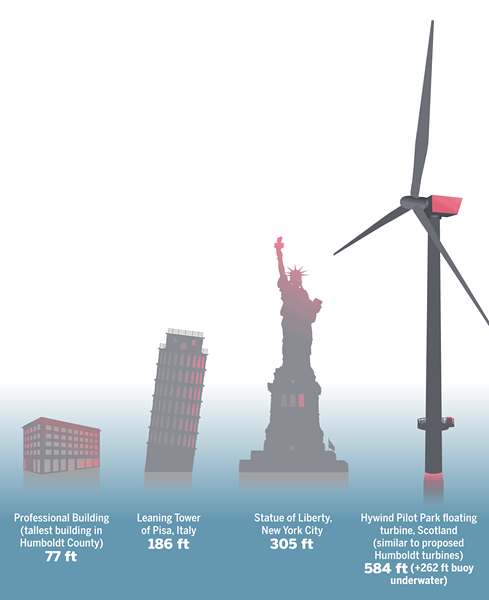 The technology, which involved massive, 750-plus-foot-tall wind turbines fixed to partially submerged barges or platforms that are then tethered to the ocean floor, is proving viable, with the first full-scale deep water wind farm opening off the coast of Scotland last fall, after nearly a decade of pilot tests. State officials in California, which passed Senate Bill 350 in 2015 pledging the state to transition to 50 percent renewable energy by 2030, have taken notice and begun looking at offshore wind as a viable option for reshaping the state's electric grid. "Three years ago, offshore wind energy wasn't in our thought process," said California Energy Commission Renewable Energy Integration Specialist Michael Sokol at a recent meeting convened by RCEA. He made clear that it is now. Part of what's tantalizing about offshore wind for state officials is its potential balance with the state's existing solar infrastructure. 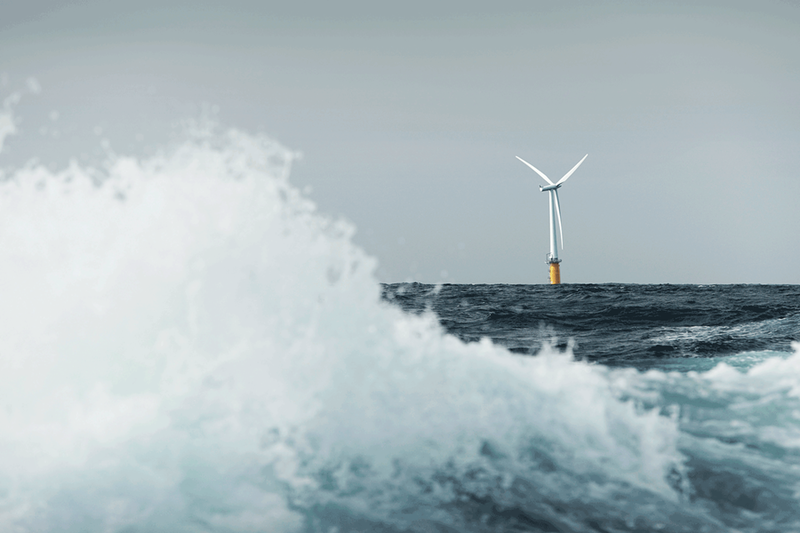 While solar energy production peaks at midday and vanishes at sunset, offshore wind would see its highest production in the late afternoon and evening, lessening the need for energy storage. With California officials feeling an urgency to find renewable technologies that could work on a large scale and the emerging floating platform technology making the Pacific Coast potentially viable for offshore wind, eyes turned to the Central Coast. While the wind potential down south isn't as strong as off the North Coast, its proximity to population centers and energy infrastructure made the location a natural fit. State and federal officials were busy last summer conducting hearings and outreach on a lease application for a wind farm near San Luis Obispo until the U.S. Navy quietly threw a wrench in those plans back in August, signaling that it would veto the application because it could interfere with military testing operations. But the Navy didn't stop there, deeming the entire coastline from Los Angeles to north of Big Sur — more than 35,000 square miles — off limits. "These things are huge," said Scott Morgan, a deputy director of administration in Gov. Jerry Brown's office at the recent RCEA meeting. "The blades on them are monsters." 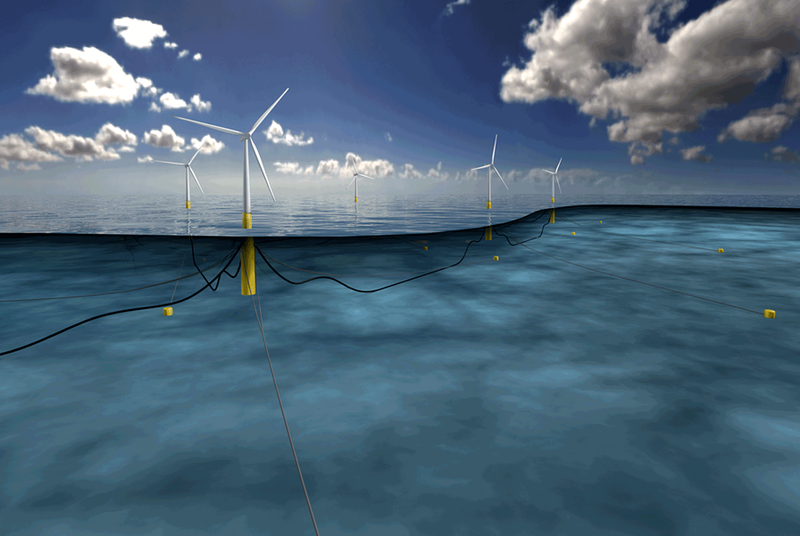 At that point, Marshall says, RCEA had already entered into a partnership with Principal Power Inc., a technology and services provider for the offshore deep water wind energy market based in the Bay Area, to assess the potential of offshore wind energy. As the community choice aggregator for Humboldt County, RCEA has a clear stake in the outcome of the process and Marshall says the agency also wanted to ensure a local entity is involved in the process and conversations in order to retain some local control and ensure Humboldt doesn't end up at the whim of a large, multi-national energy company. But when news of the Navy's veto of the majority of California's coast became public, Marshall says things kicked into high gear. RCEA is now circulating a request for qualifications, looking for other entities with the "needed technical and financial" means to help cooperatively develop Humboldt County's offshore wind infrastructure. The agency hopes to find partners by the end of March. Marshall says, the plan is to start small with a farm consisting of 10 to 15 wind turbines located 20 to 30 miles offshore, with the potential to scale up. For the moment, there isn't much incentive to go larger than that, Marshall says, as the infrastructure to connect Humboldt County to the rest of the state's electric grid doesn't exist, meaning it can't export excess electricity. As the executive director of the Environmental Protection Information Center, Tom Wheeler jokes that he's often in the position of playing bad cop and shooting holes in development ideas. But not in this case. "So far, we've been really excited about the conversation," he says, making clear there is still lots of information to be gathered and many questions to be answered. "It seems like we could have good, blue collar jobs and clean renewable energy from this project. It's just making sure we do it in a way that minimizes impacts to wildlife." The wildlife impacts question seems a hard one to answer, as there's been minimal study on the issue so far. At 20 to 30 miles offshore, Wheeler says there aren't the concerns about harm to bald eagles, golden eagles and bats that onshore wind farms bring. But there are some concerns about impacts to pelagic birds and marine life. Most notably, Wheeler says there is the question of whether the vibrations or sounds from the windmills would affect migrating whales along the coast, which is currently unknown. Wheeler also says he's heard concerns that the floating platforms could attract sea birds by becoming "reef-like" ecosystems that draw fish and, consequently, feeding birds that would then get caught in the propellers. "There are some concerns but we're at the investigation stage right now, and I fully support the investigation," he says. "I think this could be a great thing for Humboldt. This could be really cool." Humboldt Bay Harbor District CEO Larry Oetker says the topic of an offshore wind farm has been on his radar since he stepped into the job in December. If things move forward, Oetker says, it would necessitate infrastructure improvements in the bay. Currently, he says, the bay entrance is deep enough and wide enough to accommodate barges pulling the wind turbines into port for maintenance and repairs. The problem is the docks in the bay — all of which were built primarily for loading and unloading wood products — can't handle the weight of the turbines, which run some 500 tons. But rebuilding one of the bay's docks to accommodate that kind of tonnage, along with the hoists needed to move things of that size, could create a host of other shipping possibilities. "That would open up a whole container world to us, having containers come in and out of the port," Oetker says. 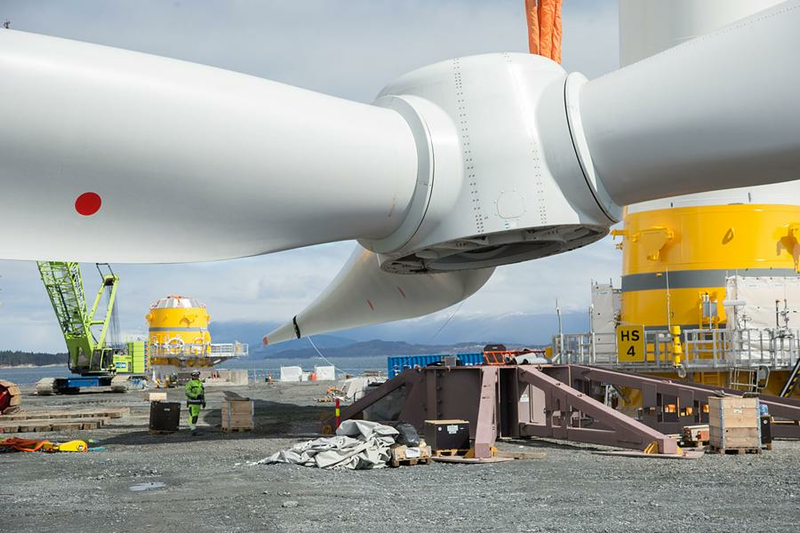 While at least initially the turbines themselves would be shipped to the North Coast, Marshall says, there would need to be local maintenance and repair crews, which would create some jobs. But if the farm proves successful and scales up, there's the potential for the large-scale creation of well-paying jobs locally. The port of Grimsby in England used to be home to one of the world's largest fishing fleets back in the 1950s, but declines in fisheries and territorial squabbles over the waters of neighboring countries have largely decimated it, sending the city into a deep economic slump and one of the nation's highest unemployment rates. But about a decade ago, energy companies came calling about offshore wind. "To be truthful, it sounded a load of rubbish," Port Chief Martin Boyers told Public Radio International. "It's turned out to be very good for us." If the pilot project gets up and running and does well, Marshall says, there's similar potential in Humboldt County. He says he can envision wind power companies buying up land on the Samoa Peninsula — which is designated as a free trade zone and comes with some special tax benefits to companies located there — and producing turbines locally. Further, he says, there's the potential for numerous licensed farms along the Northern California and Oregon coasts, with Humboldt Bay serving as the production and maintenance hub. "If the sector really takes off, then there's that potential next phase," he says. But that's all putting the cart way before the horse. Marshall says RCEA is currently meeting with stakeholders and gather public input, having already met with representatives of the fishing industry, local governments, environmental groups and local tribes. So far the feedback has been invaluable and largely supportive, Marshall says. As an example, he says fishermen balked at the initial proposal to locate the farm 15 to 20 miles off shore, saying 15 "would be horrible," but were fine with it being 20 to 30 miles out, so RCEA adjusted plans accordingly. The added distance, Marshall says, will also mean the turbines will be even less visible from shore. Spotting them, he says, will be somewhat like trying to find the smoke stack on the old pulp mill while standing on Trinidad Head. "Getting 20 to 30 miles off the coast, you're going to be lucky to be able to see it on a clear day with binoculars," he says. Meanwhile, RCEA hopes to identify partners with an eye on hitting the ground running on a proposal this spring. But Marshall warns the process will be slow. Once RCEA has partnerships in place and its ducks in a row, it will begin the lease process with the Bureau of Ocean Management by submitting an application. If the bureau deems there's competitive interest — which seems likely in this case — it would put the lease out to auction. Once a high bidder secures the rights, the project would then undergo studies, evaluations, site plans and environmental review. "We have to plan to plan, then comes the planning, then reviewing the plan," he says. "There are going to be countless phases of permitting and planning."